A little dirt road ambled through the vineyard in the foothills of the Sierra Mountain Range and tempted us to to pull the car over over to shoot our video for Wine Wednesday. It was a beautiful spring day, not a cloud in the sky and a light breeze. 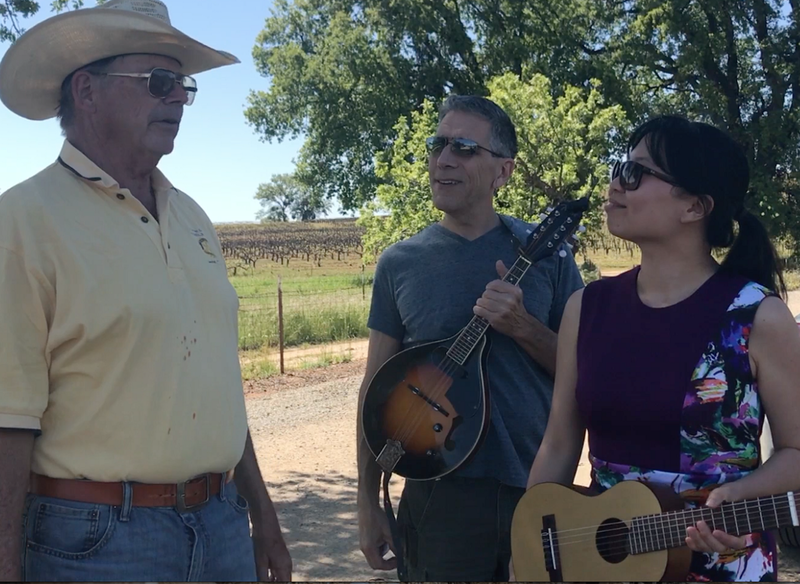 We got out our mandolin and guitalele (a kind of guitar and ukukele combined) and did a version of the Gershwin classic, “Summertime.” We had just finished recording when a car pulled over and the window rolled down. A kindly gentleman leaned over to the open window. “Would you like me to take a photo?” he said. This was Jim Gullett, the owner of Vino Noceto Winery. 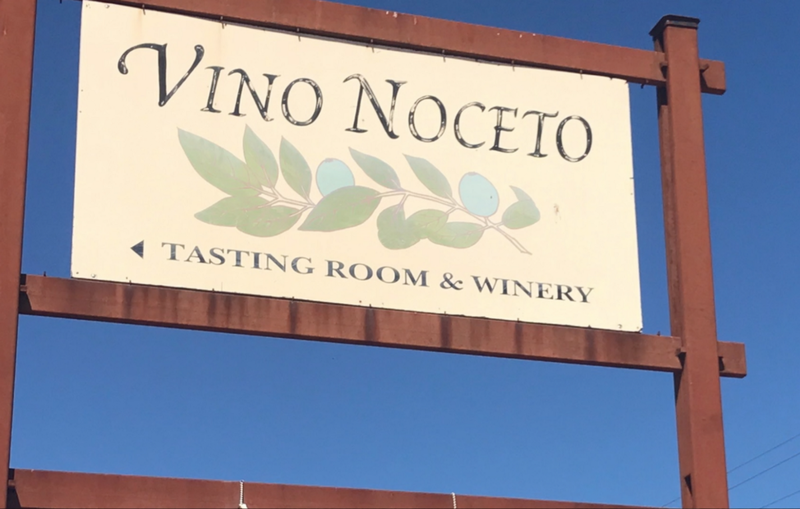 We were by now quite accustomed to the wines and friendly atmosphere of the boutique Vino Noceto Winery, having just sampled their offerings in the tasting room and having spent a good amount of time discussing the vintner family’s labor of love with Jim’s daughter, Lindy Gullett. In our conversations with both Jim and Lindy, we learned quite a bit about the business. They have been up and running for over 30 years, having produced 27 vintages of Italian varietals, mostly based on the Sangiovese (Italian for “blood of Jupiter”) grape. Jim and his wife, Suzy, bought the 40-acre property in the town of Plymouth in the Shenandoah Valley while they were still living in the Bay Area. The land sits smack in the middle of the fast-growing Amador County wine region. A grove of walnut trees on the property gave them the idea to name the place Noceto, which means walnut orchard in Italian. The town of Noceto, Italy is the sister town of Walnut Creek, CA, where Suzy was raised, adding support to their decision on the new brand. Chatting with Lindy Gullett, VP Sales at Vino Noceto Winery. Jim and Suzy did their homework before planting their vineyards. They studied the climate (long, dry, hot summers), elevation (1,400 feet) and soil (sandy loam with granite particulate) for their property and took a trip to Italy when their sons were just toddlers and before Lindy was born. It was there and then that they decided to plant a version of the classic Italian Chianti. The winery started as a weekend project, with Jim and Suzy and the kids making the trek from Lafayette, CA to the vineyard. 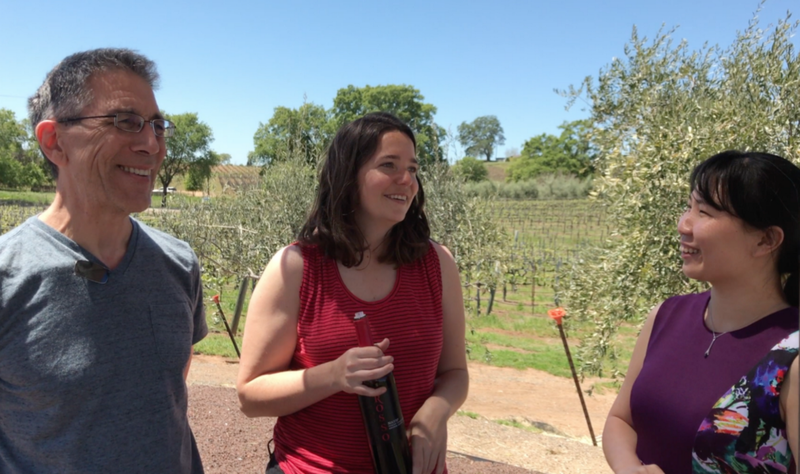 “They thought it was a great hobby and then realized you can’t run a winery from somewhere else and it can’t be a hobby,” says Lindy, with a laugh. And the rest is history, as they say. What we especially appreciated about Vino Noceto, the beautifully balanced wines aside and amicable family members aside, was their love of wine combined with music. “The music you listen to actually has an effect on the taste of the wine,” says Lindy, who attended a seminar on the very subject of music and wine. Andrea Boccelli, the renowned tenor, apparently is suitable for any of the Vino Noceto wines, she adds. We sampled a bit of Vino Noceto’s Rosso Tuscan blend. It’s 90% Sangiovese, and 2% each of Barbera, Syrah, Petite Syrah and Aglianoco. “It’s the kitchen sink of blends,” says Lindy, who calls the vintage the “ode to Amador” for its big fruity, robust flavor. So how about the Gershwin song we mentioned. How would it fare with the Rosso? “Quite well,” says Lindy, with enthusiasm. On that bright, sunny day amid the fragrant vineyards in the Shenandoah Valley of California, we couldn’t have agreed more. WineWednesday Ep. 13 — Vino Noceto was originally published in WineWednesday on Medium, where people are continuing the conversation by highlighting and responding to this story.